My edition: Paperback, published in 2011 by Sphere, 480 pages. Description: Issy Randall can bake. No, more than that - Issy can create stunning, mouth-watering and divine cakes. After a childhood spent in her beloved Grampa Joe's bakery she has undoubtedly inherited his talent. So when she's made redundant from her safe but dull City job, Issy decides to seize the moment and open up her own cafe. Meet Me at the Cupcake Cafe is an absolutely lovely read, filled with (mostly) likeable characters I just wanted to squish by the end of it. Especially Louise and Darny. And Austin, of course. Not only is this a wonderfully sweet chick-lit, each chapter starts with a mouth-watering recipe which is a fabulous bonus. 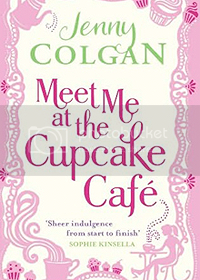 Unsurprisingly I wanted to start baking my own cupcakes as soon as the book was finished, and even that author Jenny Colgan caters too with a few extra chapters of recipes.